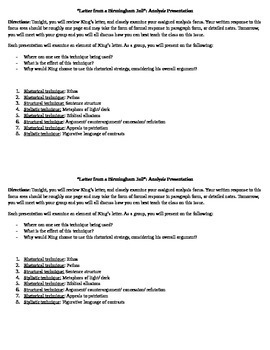 I use this assignment to have the students examine "MLK's Letter From a Birmingham Jail" more closely. Each group is assigned a facet of his argument-- they take a class period to prepare a short lesson on their topic and then present to the class. It's a very handy way to do a modified jigsaw and help students practice their analysis and presentation skills.